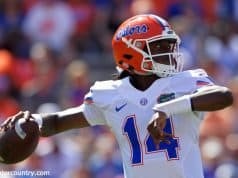 They did their best to stress out fans by quickly losing a 10-point lead at halftime but an inspired defensive effort that that saw Georgia only score a single field goal in the final 9:48 of the game allowed the Gators to come out with a 62-52 road victory. Florida’s offense had it’s ups and downs, much like it has all season, but the work on the defensive end that had Georgia shooting 39.5% from the field while turning the ball over 20 times was what won them the game. Kevarrius Hayes was a monster on the defensive end with 2 blocks and 2 steals and his ability to switch out and guard on the perimeter helped stymie the Bulldogs. Offensively KeVaughn Allen lead the way with 13 points including the valuable free throws that kept the game out of reach for Georgia. Though offense continues to be an issue for this Florida team their defense won them another game and sent a sold-out Georgia crowd home angry. For the first time since at least 2000 (I couldn’t find good enough data for the years prior) the Gators started three freshmen in Andrew Nembhard, Noah Locke, and Keyontae Johnson with Johnson getting his first start of his career. He played great basketball with 8 points, 6 rebounds, and 2 blocks, with many of those rebounds and blocks being plays I don’t think anyone else on the team could have made. The element of athleticism he brings is immediately apparent and was seen in the first half when he caught the ball in the corner, attacked Derek Ogbeide towards the baseline, and finished with a strong reverse layup. I think we’ll see this starting group again moving forward. After a tough start to the SEC season Keith Stone looked like he was turning a corner with 8 quick points including a monster left-handed slam in traffic. Unfortunately, in a play where he was sprinting back in transition he elevated, blocked a shot that prevented a bucket, and then came down awkwardly with an apparent lower body injury. I haven’t gotten an update yet as to what exactly the injury is but I’m hoping for the best. 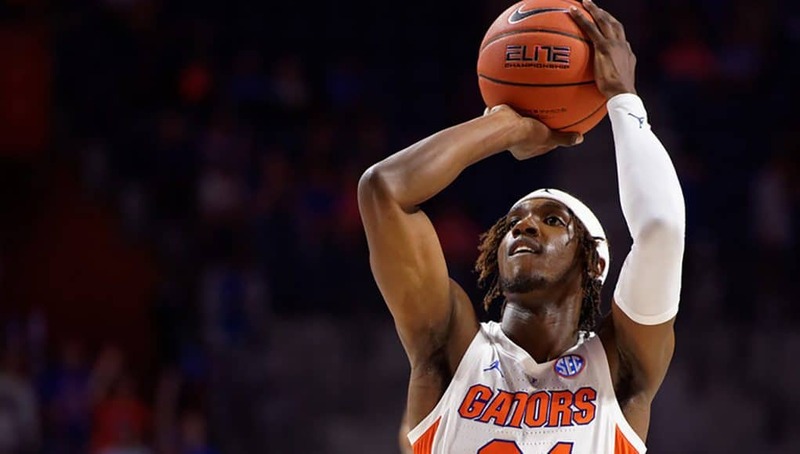 The fact he was playing one of the best games of the season so far and injured himself while making a big-time hustle play shows how unlucky things have been for the Gators. Hopefully we’ll receive an update soon. Perhaps the most impressive part of the Gators’ defensive onslaught was the fact that they held Georgia’s leading scorer Rayshaun Hammonds to 0 points. Averaging 13.7 points entering the game he’s the focal point of the Bulldog offense and the Gators completely took him out of the game, forcing the ball out of his hands on the perimeter and swarming him with 2 defenders if he got the ball inside. With Hammonds completely neutralized the Bulldogs struggled to generate offense against the pesky Gators. The Gators put their bodies on the line today with 4 charges drawn. Those were all big plays that changed the momentum of the game and Dontay Bassett (who drew 3) and Kevarrius Hayes (who drew the other) deserve a lot of credit for moving their feet to get in legal guarding position and for being willing to take a hit to the chest for their team. On Bassett’s second charge of the game he didn’t just get it to the chest as he took a hearty shot to the face, one that took him a while to recover from. There was a large part of me that expected to see him leaving in concussion protocol but instead he decided to re-enter the game and take another charge for good measure. This was great toughness shown by the Gators’ centers and I’m sure the rest of the team took notice. This wasn’t always pretty and though it didn’t end in them losing the game the fact that they had a 13-point lead at one point and let it slip still hurts. This is a team with a history of letting leads evaporate and though it didn’t burn them tonight it’s still an ongoing issue. 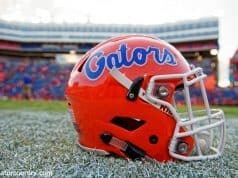 However, the Gators really need wins and they got one today. 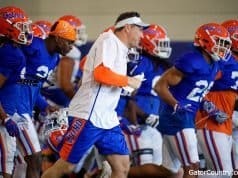 They have Texas A&M up next, another beatable team that the Gators can hopefully get a W against and start building up some momentum.